Microsoft, Brookfield Renewable Partners, and Procter & Gamble are three very different dividend stocks. You just have to choose the one that's right for your portfolio. Dividend stocks shouldn't be picked based on dividend yield alone. It's an important factor, to be sure, but only one of many that you need to consider. Which is why you should dig into the story behind the dividend stocks you buy, as these three Motley Fool contributors did with Microsoft Corporation (NASDAQ:MSFT), Brookfield Renewable Partners LP (NYSE:BEP), and The Procter & Gamble Company (NYSE:PG). With yields ranging from a modest 1.5% all the way up to a fairly generous 6.4%, all offer investors compelling reasons to own them beyond their dividends. Here's a quick rundown on why each could help you fund your nest egg. Chris Neiger (Microsoft Corporation): Microsoft may not be the most obvious choice on a list of dividend stocks to fund your retirement, but there's a lot to love about this company. First, it pays a respectable 1.5% dividend yield right now and has raised it for 14 consecutive years. But the company's growing leadership position in the cloud computing space should really get long-term investors excited. Microsoft made its name with its Windows operating system and its suite of Office products, but the company's latest focus is on building out its lucrative cloud computing services. Its intelligent cloud business saw sales pop by 23% in the most recent quarter, and the ongoing revenue growth has created a cloud business with an annualized revenue run rate of more than $20 billion. This matters a lot for Microsoft and its investors because in just two years, the public cloud computing market is expected to be worth $411 billion. The company is entwined in a cloud computing battle with rival Amazon, which holds about 33% of the market, compared to Microsoft's 13%. But Microsoft doesn't need to take the leading position to benefit. The tech giant already earns about 32% of its top line from cloud computing, and its investments in this space have helped push its market share up by 3 percentage points over the past year. While Microsoft still benefits from its legacy software products, the company's future is being built in the cloud. Investors who are looking for a stable company that can grow revenue and earnings from its cloud computing solutions for years to come should give some strong consideration to Microsoft. Travis Hoium (Brookfield Renewable Partners LP): If you're trying to build a nest egg, a great way to start is by owning companies that generate consistent returns and pay a solid dividend. One such stock is Brookfield Renewable Partners, which owns renewable energy assets around the world. About 82% of the company's assets are hydroelectric plants, which in some cases have decades of operating history. Wind, solar, and other renewable assets make up the remaining 18% of the portfolio, but are growing in importance as the partnership expands. What separates Brookfield Renewable Partners is its corporate goals. The company doesn't aim to grow at all costs, selling stock or debt to fund acquisitions. Instead, it targets holding on to 30% of its cash flow from operations to fund organic growth and acquisitions; 70% of the funds are paid as a dividend, but the 30% it holds on to drives an organic 5% to 9% dividend growth target. Brookfield Renewable Energy Partners is well positioned in the energy industry, owning clean power generating assets that will have value for decades to come. And its slow and steady approach to growth should help drive shareholder value. 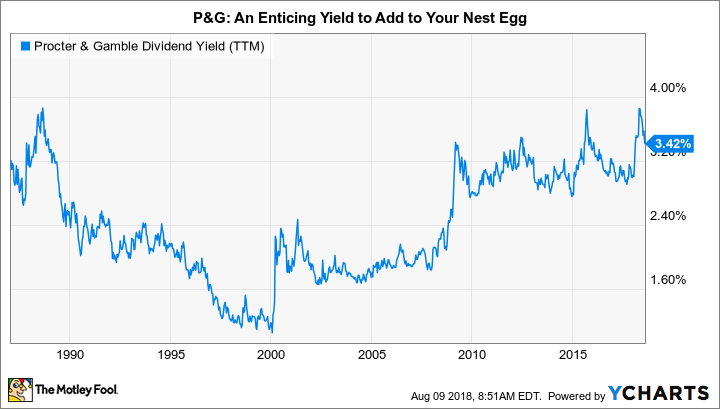 A dividend yield of 6.4% today doesn't hurt, either, for investors starting to build their nest egg. Reuben Gregg Brewer (The Procter & Gamble Company): Procter & Gamble's roughly 3.5% dividend yield is at the high end of the company's historical range. That's an opportunity for income focused investors to pick up an industry-leading consumer products company while it appears to be on sale. PG dividend yield data by YCharts. TTM = trailing 12 months. The problem is that Procter & Gamble is on sale for a reason. Consumer buying habits are changing, with increasing demand for "natural" products. Upstarts are using the internet to quickly take on larger rivals, a notable headwind in the company's Gillette razor business. Both of these factors have led to sluggish sales growth. And now, rising costs are pressuring profit margins, since the company, like most of its peers, has had difficulty passing on higher costs to customers. But Procter & Gamble isn't sitting still. It has been busy adjusting its portfolio, slimming down to focus on its best brands. It's introducing new products to better meet customer demands, like cotton-based diapers. And it has been more aggressive in taking on upstart competitors, including reducing prices in the razor segment. Inflation, meanwhile, ebbs and flows over time, and costs will eventually get passed through to customers in some fashion. But this is all par for the course. Procter & Gamble is more than 100 years old. It has increased its dividend annually for an incredible 62 consecutive years. Trust me: Today's headwinds rhyme with ones it has successfully navigated in the past. Moreover, with long-term debt at about 30% of the capital structure, it's working off of a strong financial foundation. Procter & Gamble is a solid option for long-term dividend investors looking to build a nest egg (while those focused on the short term fret). If you are looking for dividend stocks, Microsoft, Brookfield Renewable Partners, and Procter & Gamble are names you need to consider. Microsoft and P&G are old-school giants that are working to shift with the times. Microsoft has been having a better go of it with its cloud investments. Its yield is relatively modest, but that's simply a recognition of the still-robust growth opportunities ahead. P&G is struggling a little today as it works to better serve its customers, but that could be a high-yield buying opportunity for patient investors willing to give management some time to switch gears. Brookfield Renewable Partners, meanwhile, is a relatively young partnership using an interesting self-funding approach to grow its business and dividend in the increasingly important renewable power space. A robust yield and business plan should reward those seeking steady dividend growth. If you take some time to get to know these three stocks a little better, I'm confident that one (or more) could end up in your portfolio.